Explore the underwater world on this introductory scuba diving adventure from St Maarten. During this 4-hour activity, perfect for beginner divers, slip into the calm Caribbean water to discover shallow dive sites accompanied by a PADI instructor. This tour is limited to twelve people to ensure safety and personalized attention. Choose between a morning dive departing from Divi Little Bay or an afternoon dive from Simpson Bay. Depending on your choice of morning or afternoon dive, meet your dive instructor and small group at either Divi Bay Resort (morning, 10 am) or Simpson Bay Resort (afternoon, 1pm). If you are arriving at Dock Maarten via cruise ship you will find our dive shop a five minute walk away. Watch a short instructional video and get a safety briefing from your certified scuba instructor. 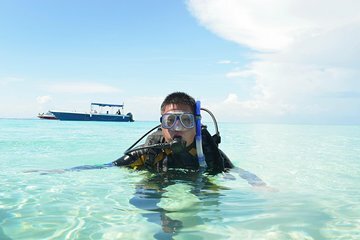 Although this diving experience is not a scuba certification course, you can get credit toward PADI Scuba Diver or Open Water Diver certification if you choose to continue diving. Board a well-equipped boat to head out toward the reef. When you reach the dive site, get help with your equipment and slip into the calm sea at your own pace. Get used to what it feels like to breathe underwater and how to communicate with fellow divers. Follow your guide to explore the dive site, looking for eels, sea turtles, stingrays and schools of tropical fish darting among the colorful corals and sea sponges. At this shallow wreck site off shore in Divi Little Bay, dive to a depth of 30 feet (9 meters). Explore a deliberately sunken submarine as well as a more recent helicopter. During the afternoon tour, depart from Simpson Bay Resort and enjoy coastal sightseeing as you cruise to an offshore reef site. Please note: This tour is suitable for children aged 12 years and up. Medical forms must be completed and signed by a doctor before the day of your scuba tour to ensure fitness levels and health for the experience. The medical form will be made available by the supplier once the booking has been processed. This outfit was amazing. My wife was hesitant to explore scuba but once in the ocean the dive master focused on helping my wife. She had such a great time she has become PADI certified! We were very nervous for our first dive but the instructor immediately calmed those fears. We were throughly instructed on land and prior to the dive and felt comfortable once we started the dive. Saw lots of fish and dove at the marine park in Little Bay. Would definitely do again! Instructor at the divi bay resort was great, but this should not be described as 4 a hour tour. The entire experience took 2 hours, with total dive time of 30 minutes. Was also disappointed with amount of sea life that we experienced. good tour. would do it again. beautiful island. Gave this as a Christmas gift to my son and his finance. It was a beautiful day, they told me. Pool experience was great. They got into the ocean and visablility was zero. That was a costly gift to see nothing. Vendor did not tell them ahead of time and no alternate dates were offered, not even a come on back and snorkel with us. Definitely wouldn't recommend and we are in st Maarten every year. the place was hard to find, had to take 2 taxis because the first dropped us off at the wrong dive shop. Other then that it was great, my kids loved it said it was teh best thing they've ever done. staff was fantastic. Gave them a tip to drop me off back at the cruise ship instead of doing a land taxi. was so much shorter. There was a lot to see at the dive. The staff was great and friendly. We got tons of attention. My daughter is 14 and this was her first dive, and Damien took such great care of her. He made sure she was watched like a hawk and educated her well on all the basics. The water was beautiful, the ride out to the dive spot breathtaking, and everything was organized. Not one bad thing to say. I highly recommend this trip.